Every so often we might hear of a re-make of an old classic game, or an HD upgraded version of a game but that doesn’t even come in close comparison to this. Remember the awesome 16-bit era? Remember playing the Sega Genesis for hours on end, especially during the weekends hanging out at your friends house? If so, your dreams have come true. Michael Mendheim is bringing back Mutant League Football in a whole new way. It’s called Mutant Football League and it’s headed your way to PC/Steam, Xbox One and PS4. Those of you who have played it know how awesome it is. Skeletons, Monsters, and Angry Owners oh my! The graphics were smooth, the sound was intense and the plays were memorable. Countless hours drifting off into my own little world playing this before bedtime, playing in between homework and between TV shows. Seeing two helmets collide every time I turned the game on and the humorous sayings from the coaches. I played to win and that meant eliminating my opponent. So you can imagine how excited I was to hear about the re-make on PC, Xbox One and PS4. This is a big deal. Infact, this is a huge deal. 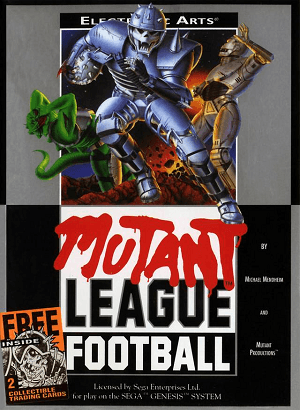 Mutant League Football spawned a cartoon, comics, and yes even had a movie. I miss those good ol’ 16-bit days and it’s hard to bring back that nostalgia, but with Mutant Football League on the way it’s good enough for me. P.S. Did I mention Michael Mendheim will be a guest on our show this week? Been dropping quarters since pac-man. Grew up in my dad's friends arcade in NJ and then onto the NES at home. Co-Host on 4 Guys with Quarters and Associate Editor.